The General Factor of Intelligence: How General Is It? 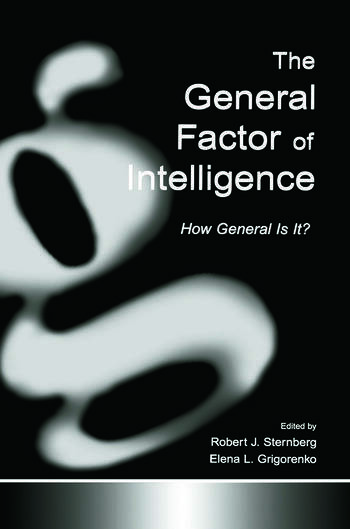 This edited volume presents a balanced approach to the ongoing debate of just how general the "general factor" of intelligence is. To accomplish this goal, the editors chose a number of distinct approaches to the study of intelligence--psychometric, genetic-epistemological, cognitive, biological, behavior-genetic, sociocultural, systems--and asked distinguished scholars to write from the standpoint of these approaches. Each approach comprises two chapters, one by a scholar leaning toward a view arguing for the greater generality of g, and the other by a scholar leaning toward a view arguing for the lesser generality of g. The scholars are not simply "for" or "against" these outlooks, rather they provide a more textured view of the general factor, attempting to explain it in psychological terms that are easily understandable. Intended for psychologists in all areas, including clinical, consulting, educational, cognitive, school, developmental, and industrial-organizational, this book will also be of interest to educators, sociologists, anthropologists, and those interested in the nature of intelligence. Contents: Preface. Part I: Psychometric Approach. A. Demetriou, Tracing Psychology's Invisible Giant and Its Visible Guards. L. Stankov, "g": A Diminutive General. A.R. Jensen, Psychometric g: Definition and Substantiation. J.A. Naglieri, J.P. Das, Practical Implications of General Intelligence and PASS Cognitive Processes. Part II: Genetic-Epistemological Approach. L.G. Humphreys, S. Stark, General Intelligence: Measurement, Correlates, and Interpretations of the Cultural-Genetic Construct. J. Lautrey, Is There a General Factor of Cognitive Development? Part III: Cognitive Approach. I.J. Deary, g and Cognitive Elements of Information Processing: An Agnostic View. J. Kray, P.A. Frensch, A View From Cognitive Psychology: "g"-(G)host in the Correlation Matrix? Part IV: Biological Approach. D.K. Detterman, General Intelligence: Cognitive and Biological Explanations. D. Wahlsten, The Theory of Biological Intelligence: History and a Critical Appraisal. Part V: Behavior-Genetic Approach. S.A. Petrill, The Case for General Intelligence: A Behavioral Genetic Perspective. E.L. Grigorenko, Other Than g: The Value of Persistence. Part VI: Sociocultural Approach. L.S. Gottfredson, g: Highly General and Highly Practical. C.A. Berg, P.A. Klaczynski, Contextual Variability in the Expression and Meaning of Intelligence. Part VII: Systems Approach. P.C. Kyllonen, g: Knowledge, Speed, Strategies, or Working-Memory Capacity? A Systems Perspective. R.J. Sternberg, Beyond g: The Theory of Successful Intelligence.